Santa Cruz County is home to some of the best beaches on the West Coast. Miles of uninterrupted sand, and beautiful sunset views? mmm hmmm. Beach volleyball, Sand Castle Contests, Beach Concerts? Got those too. Seabright is the valedictorian of Santa Cruz beaches. You know that kid who is just good at everything? Star of the basketball team and academic success, who aces the SAT, and somehow manages to look cool doing it? Seabright delivers on everything important in a beach. While it may not have the flashy attractions of the boardwalk or the unique wildlife of natural bridges, Seabright might just be the best classic beach hangout in town. Beaches and Bridges and Butterflies, Oh My! Looking for a great spot to watch the sunset, play in the waves, or see some local wildlife? 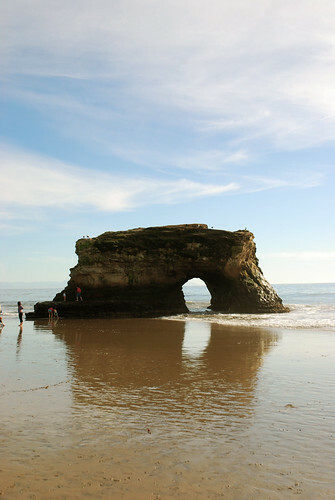 Natural Bridges State Beach is one of the best spots in Santa Cruz for doing all three. As you watch the sun dip beneath the water, you might just spot a whale or a group of sea otters playing in the kelp. If you are visiting during the day, head over to the tide pools or the eucalyptus grove full of monarch butterflies. During the fall and winter months, you can see the thousands of migrating monarch butterflies that make Natural Bridges a famous destination for wildlife enthusiasts.